Last week, I had to do a little recipe testing for an upcoming article (stay tuned and you can read all about it….). One of the dishes featured this beautiful concoction of toasted spicesâ€”homemade, home-ground garam masala. Just the sight of these ingredients evokes fall in my mindâ€”deep, rich earth tones with an equally heady aroma. There is no single recipe for garam masala. The name literally means “heating spice,” as in raising the body’s temperature. 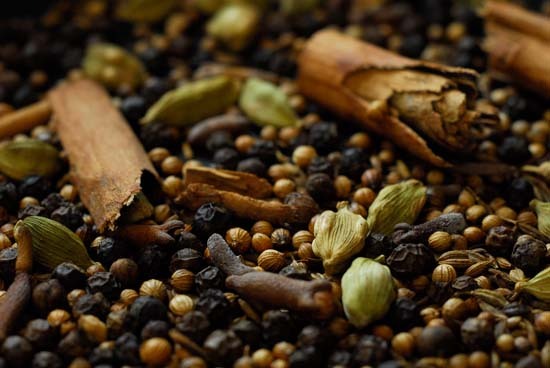 Common ingredientsâ€”black pepper, cinnamon, clovesâ€”are spices that do just that. But endless variations can include cardamom, fennel, bay leaf, cumin, coriander, even rose petal. There’s no right or wrong. Indian women traditionally buy the spices whole, then toast and grind them at home. Below is the garam masala I recently made (which offered plenty of leftovers to carry me through the month). It’s simple to make. Use it in your next full-on Indian curry recipe. Toss into potatoes or stir-fries, or sprinkle on popcorn. If refrigerated in a sealed container, it will keep a few months. Once you have made your own, you will have a hard time going back to those little jars of blended spices. Toast cumin, coriander, cardamom, pepper, cinnamon and cloves in dry skillet over medium-high heat until brown (do not burn). Remove from heat, add nutmeg and grind to fine powder. I use a mortar and pestle (the traditional method), although a coffee grinder or food processor can work.